Music desk hinge measures 1-3/8" x 1-3/4". Satin brass. Suggested screws: #RH-4B38F or #RH-4B12F. Satin brass grand lid prop. Hinged. 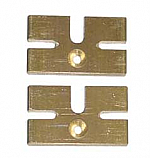 Individual section for customizing length of #RH-5385 Long Sectional Hinge. 54-1/2" long sectional hinge with 60" rod. Includes (10) 5-inch sections plus (1) 4-inch section. Suggested screws: #RH-4B34 or #RH-4B10. Brass hinge for music, desk, lid prop, etc. Suggested screws: #RH-6B38F or #RH-6B12F. For music desks, etc. High polish nickel finish. Suggested screws: #RH-4N38F or #RH-4N12F. Brass hinge for music desk, lid prop, etc. 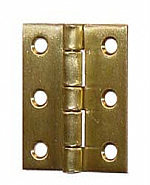 Slotted brass cheekblock plates. One pair. Large cheekblock screws with hinged heads that fold flush. Black oxide finish. 4 inches in length. Pair. Features roller bearing for easier pedal shifting. Fine-adjusts forward and back by turning the bolts. Also adjusts height. Set includes enough for one piano. Replaces old style wooden swivel lock block. Spring-loaded for solid locking. Kit for 3 legs includes two 3-5/8" pieces per leg.